I just purchased a Sans Digital MobileSTOR MS1CT+ single drive enclosure. I have many, many enclosures. Mostly firewire, some Thunderbolt, and some with a combination of eSata and USB2. What I was missing was a drive that had a fast protocol like Thunder Bolt AND eSata for some older devices. That as far as I can tell, doesn’t exist. 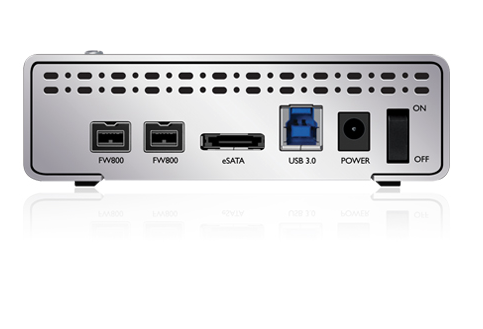 What this MS1CT does offer is USB 3, FW800 (loop) and eSata with a single drive enclosure. This allows me to connect to my iMac/Thunderbolt array via USB3, transfer my files for archive to a 1.5Tb drive, and then plug the enclosure into my Pro-Cache LTO5 with eSata. Perfect! The unit does not have a fan, but is suitable as a shuttle drive. Enclosure without a drive is $129, and comes with a wall transformer power supply, USB3, eSata, and FW800 cables. The only thing it lacks is a tray-less drive system.